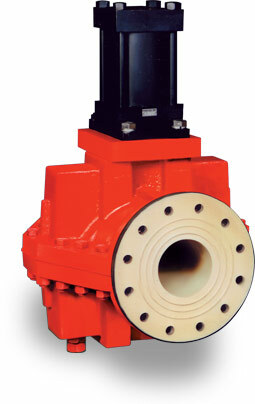 The Series 9000 high-pressure control pinch valve is Red Valve’s ANSI Class 300# control valve product. The heavy-duty elastomer sleeves are reinforced with high strength nylon, polyester fabrics, or Kevlar® material. Several heavy-duty sleeve designs are available – standard full port for on/off isolation applications; double wall for severe abrasive applications; cone, reduced port, and variable orifice designs for control applications. The elastomer sleeve will close even on solids, and the flexing action of the sleeve eliminates the possibility of scaling. Combining these features with a sealed body design and no packing to maintain, results in a simple, rugged, no-hang-up, maintenance-free valveThe Series 9000 is equipped with a heavy-duty solid steel stroke adjustment unit located on the valve base. This allows the user to fine-tune control or adjust stroke for abrasion sleeve wear. This flexibility eliminates downtime.The Series 9000 is available with various actuators. Bevel gear actuators are available for manual operation. Hydraulic or electric actuators for automatic operation are also available. Pneumatic actuators are available on smaller or low pressure applications.Series 9000 high-pressure control pinch valves are also available in ANSI Class 150 drilling configurations.